SapuraKencana Petroleum Bhd (SKP), which makes its debut on Bursa Malaysia today, will need to replenish US$1 billion to US$1.5 billion of new jobs every year to sustain a healthy backlog for the newly merged entity. President and group CEO Datuk Seri Shahril Shamsuddin said the company's orderbook currently stands at RM13.5 billion and will keep the group busy for 3½ years. "Our burn rate of RM3.5 billion to RM4 billion per year gives us three years of backlog and we have to replenish that every year," he told a press conference after the launch of SapuraKencana's prospectus and corporate identity by Minister in the Prime Minister's Department Tan Sri Nor Mohamed Yakcop here yesterday. Executive vice-chairman Datuk Mokhzani Mahathir said the group is currently bidding for RM7 billion worth of jobs and by year-end, it will have submitted bids for RM12 billion, with the success rate expected to be 30-40%. "We should be able to keep bid book high and backlog high at RM8 billion to RM12 billion a year," Shahril said. About half of the projects it has bid for are in Malaysia with the rest overseas, especially in Brazil and Australia. 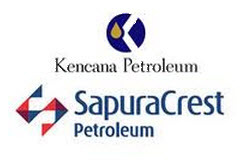 SapuraKencana is the result of the merger of the businesses and assets of SapuraCrest Petroleum Bhd and Kencana Petroleum Bhd, and is now the world's fifth-largest integrated oil and gas engineering, procurement, construction, installation and commissioning (EPCIC) services provider. On its capital expenditure, Shahril said: "We have a build programme of US$1.5 billion over three years budgeted for three new drilling rigs and five new pipelay vessels." He said the company will leverage on its US$1.5 billion business in Brazil to enter West Africa's EPCIC market. It is also bidding for projects in Brazil, as well as undertaking jobs in the Gulf of Mexico. Commenting on the impact of the global economic slowdown, Shahril said: "Throughout the years, the oil and gas sector is robust to the fluctuations of oil price. Many projects take five or six years to execute and due to the long gestation period, we find that we transcend the volatility of the marketplace." Mokhzani said should oil price fluctuate, the company knows how to operate in a lean environment and on tighter margins given its experience in operating under such a situation. "We're confident that whatever happens, the company will be resilient and pull through," he added. On when SapuraKencana shareholders can expect a dividend, Mokhzani said the cash payout to shareholders from the merger exercise is equivalent to eight years of dividends. SapuraCrest received a RM875.1 million cash payment or 69 sen a share, and Kencana RM968.7 million or 49 sen a share, besides SapuraKencana shares, from the merger exercise. "We believe we will be able to give out dividends from the first year. However, the quantum has yet to be set as we're a growing company," he said. Shahril said as the company expands its reach as an enlarged entity, it needs to support Malaysia and be a catalyst for the small and medium oil and gas companies. The company has some 9,000 employees, comprising 20 nationalities. "We support 500 local vendors and suppliers by giving out RM1.5 billion to RM2 billion worth of works to them every year," he added.